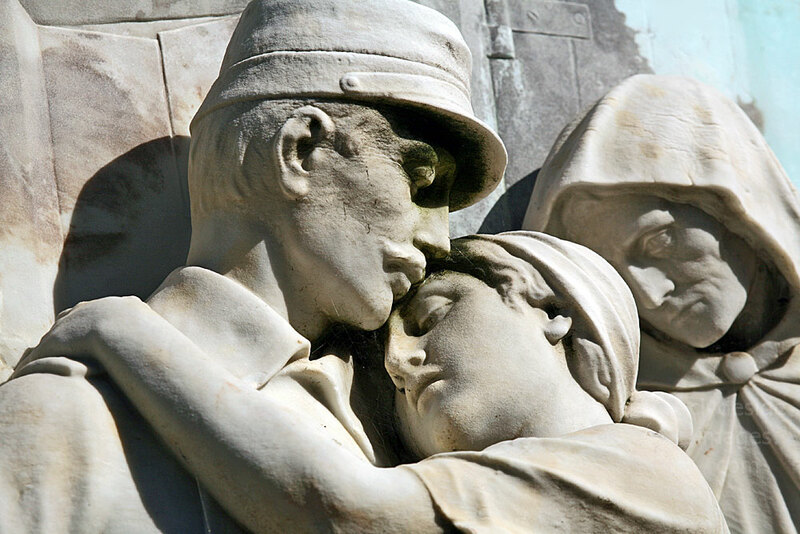 ​This evocative, superbly detailed, French memorial is located in the small, rural village of Proyart on the Somme. 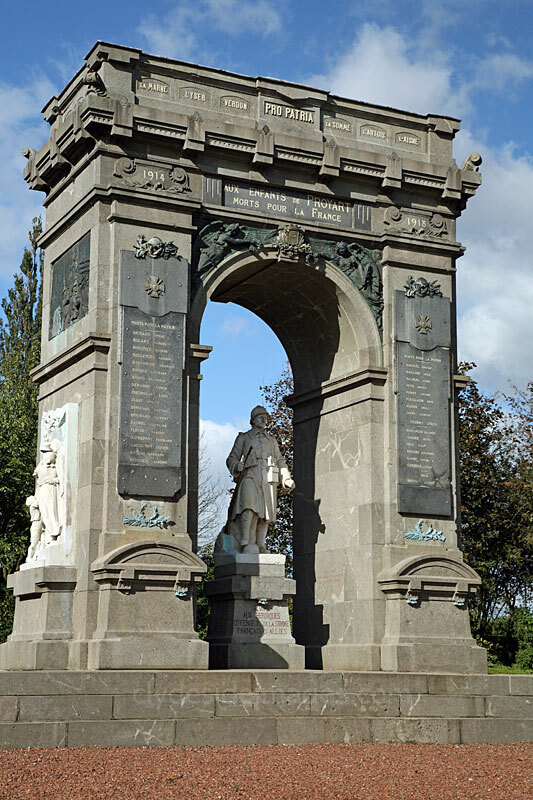 It commemorates the men who died fighting in the area during the Great War and includes a mini replica of the Arc de Triomphe in Paris. 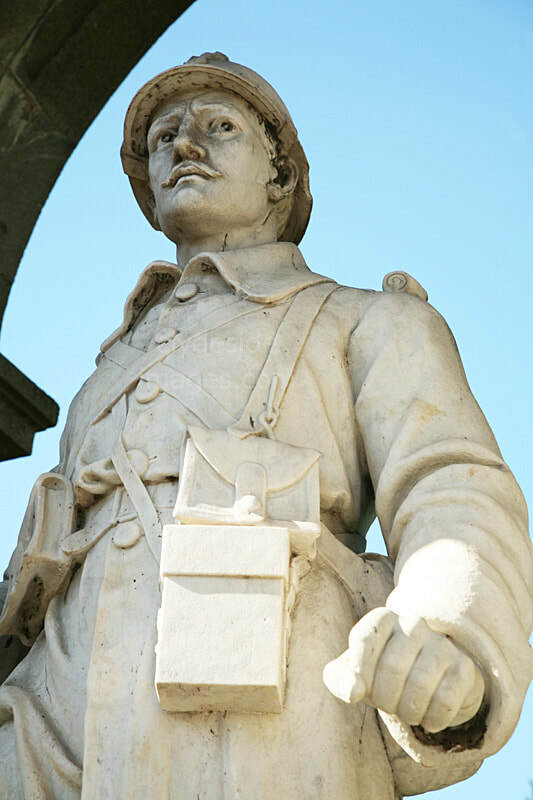 Underneath its archway this French soldier or Poilu stands in a triumphant pose with the phrase `On les a` (`We`ve got `em`) inscribed at his feet. 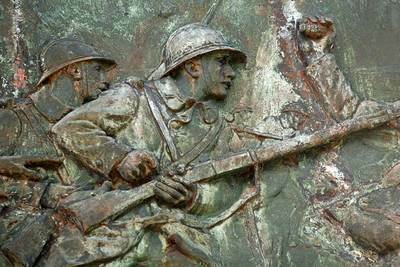 The rallying cry for the French troops at Verdun was similar - `On les aura` (We`ll get `em). 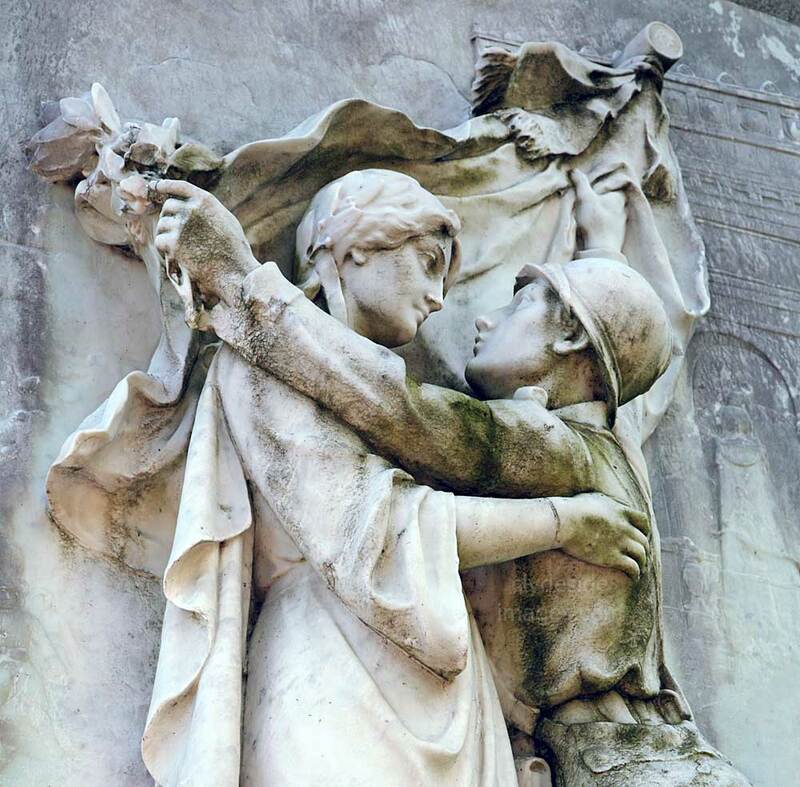 The monument, which was erected in 1924, was funded for the most part by Mr and Mrs Francois Normand who had lost their only son in the 1914-1918 conflict. 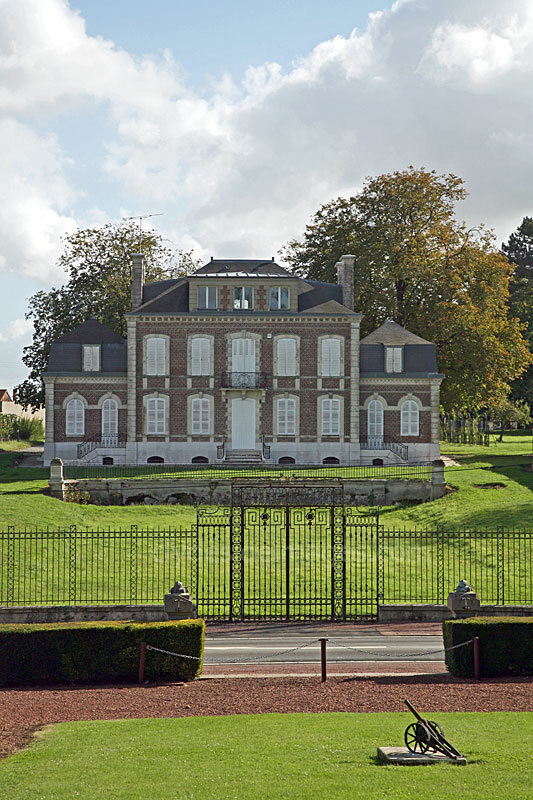 Normand was a wine merchant and the monument stands in what was originally part of the grounds of the family chateau. 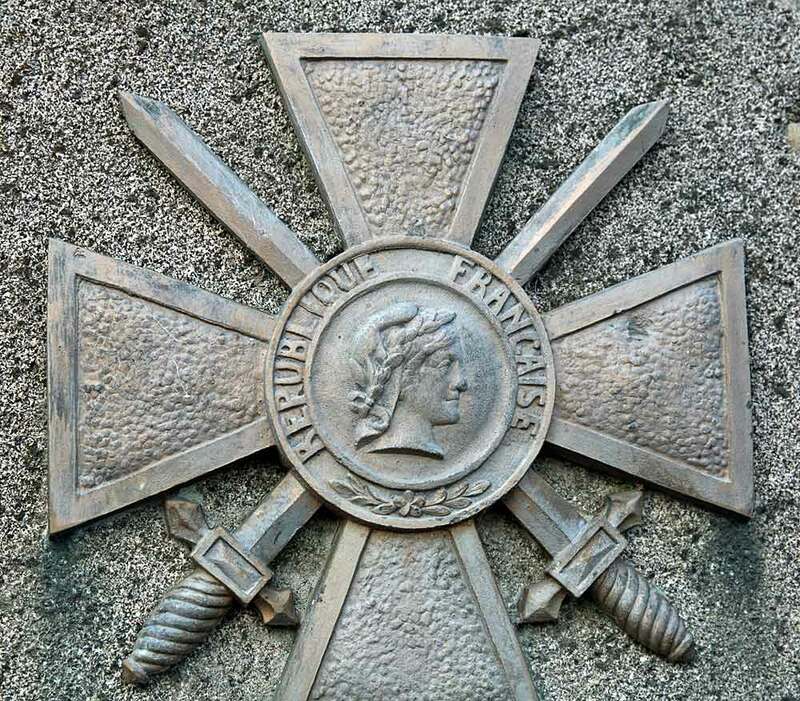 The gateposts each have a carved Croix-de-Guerre and are topped with a French Army helmet sitting on a crumpled flag. 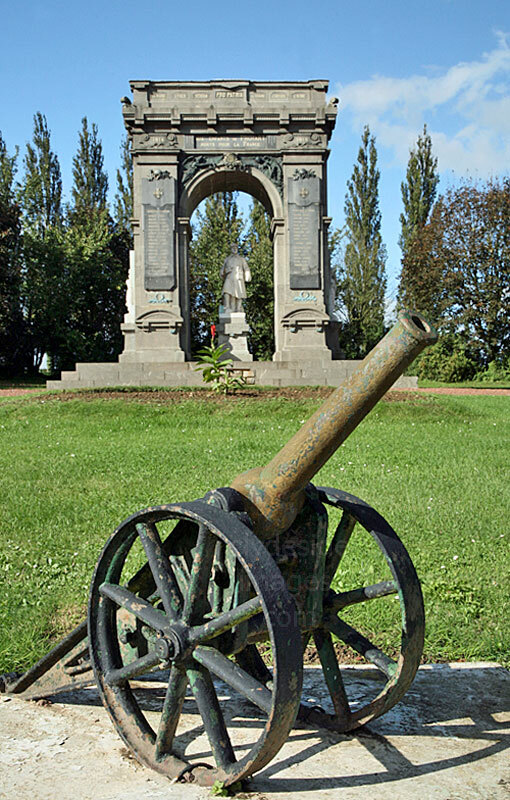 A small cannon stands on the lawn. ​The area surrounding Proyart was the scene of bitter fighting between the French and Germans in 1914. 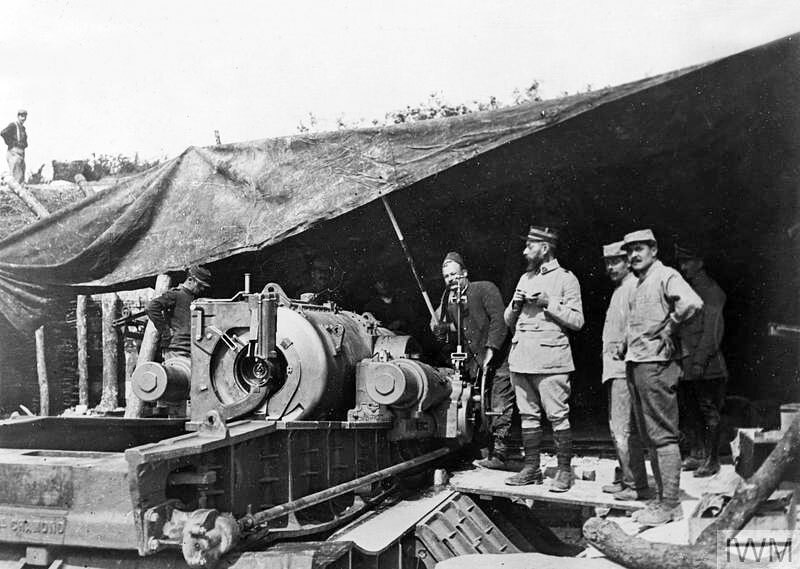 The photo on the right, taken on 23 June 1916, shows a French 370 mm howitzer in loading position with breech closed in a ravine near the village. 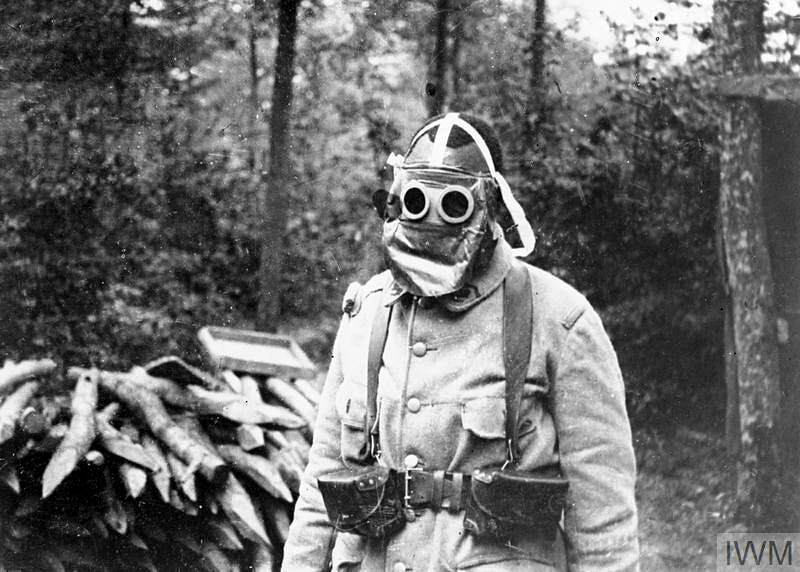 Above: French Army trench-lines and a black French ​colonial soldier wearing a gas mask. 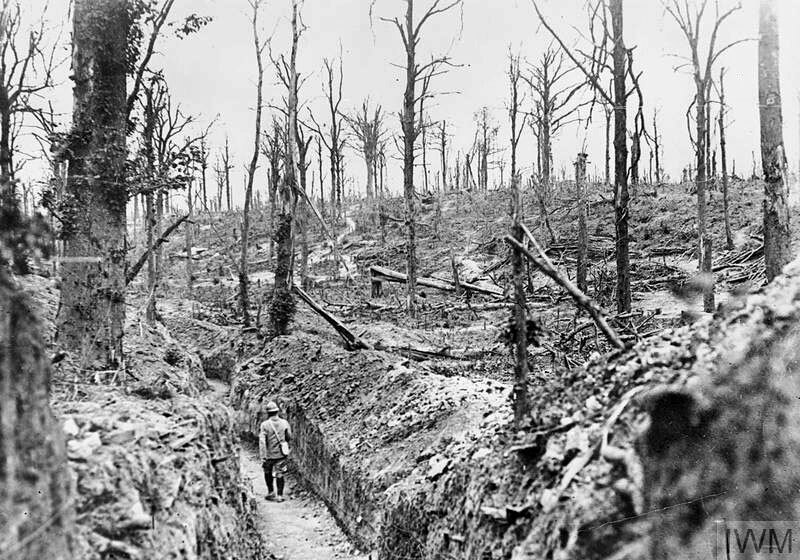 Somme area, 1916. 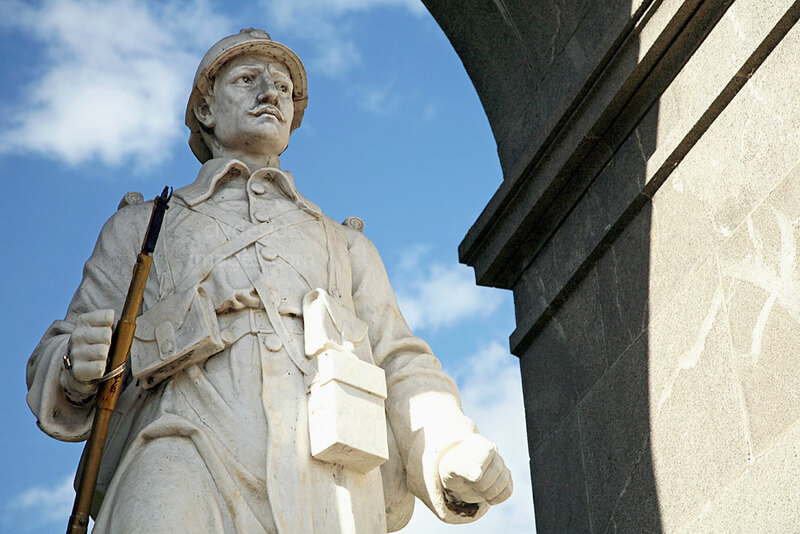 The Proyart Memorial`s central figure of the soldier is carved from marble and his rifle is made from cast iron. His right foot is resting on top of a German helmet, although the distinctive point which was originally there has long since broken off. 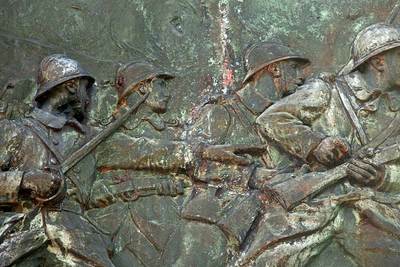 On the sides of the arch are three bas-reliefs: "Le Départ", "L’assaut à Proyart", and "La France reconnaissante à Proyart." 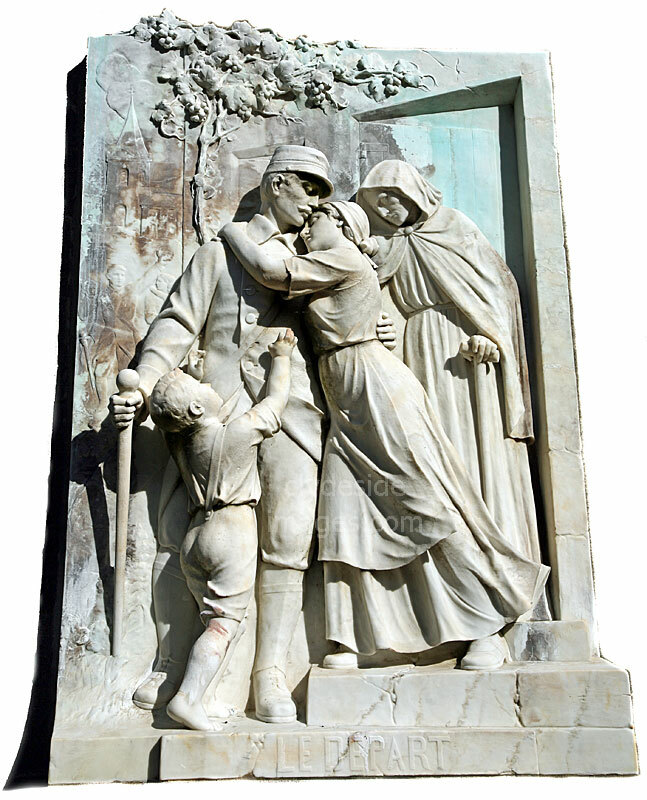 The "Le Départ"panel (above) shows a soldier saying farewell to his family before he leaves for the Front and includes a village church, which can be seen to the left of the main figures. 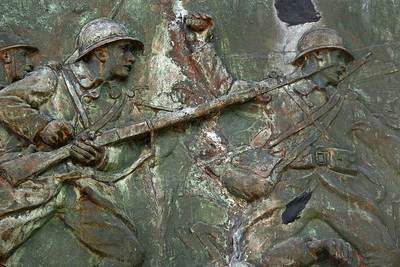 The relief titled "L’assaut à Proyart" shows a group of soldiers advancing across No Man`s Land towards the enemy lines complete with barbed wire and shell-blasted tree stumps, while others wait to go `Over the top`. 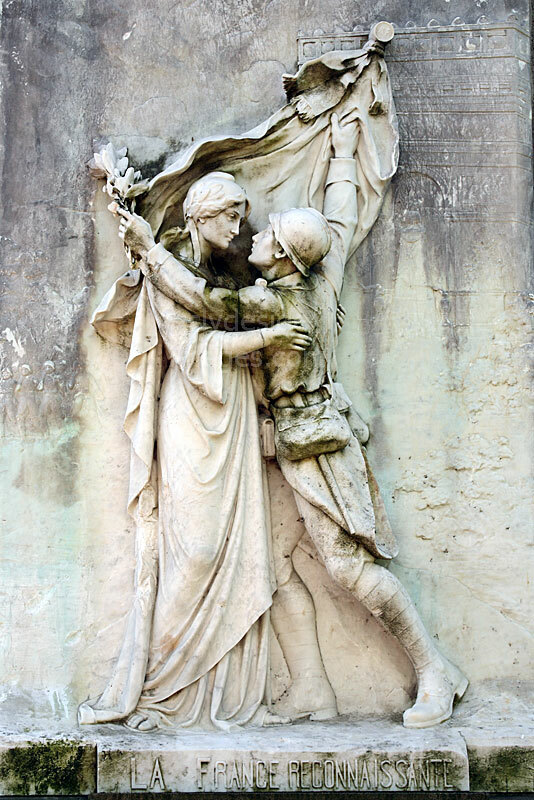 ​The relief "La France reconnaissante" (below & top) shows a victorious France wearing a crown of laurels, embracing a soldier, obviously exhausted but determinedly holding the national flag aloft. 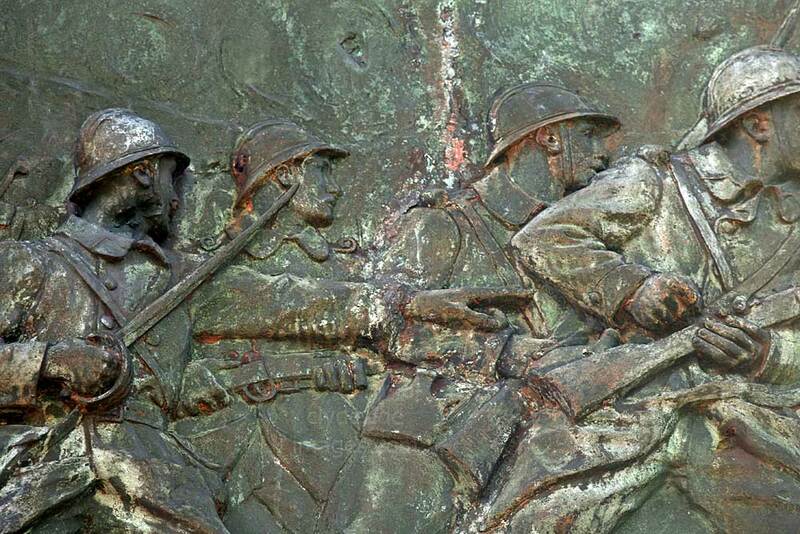 Behind the figures, a battalion of soldiers is shown marching by the original Arc de Triomphe in Paris. ​Please bear in mind that all images on this website and my blog are Copyright. They are not free to use and have been embedded with a digital watermark. 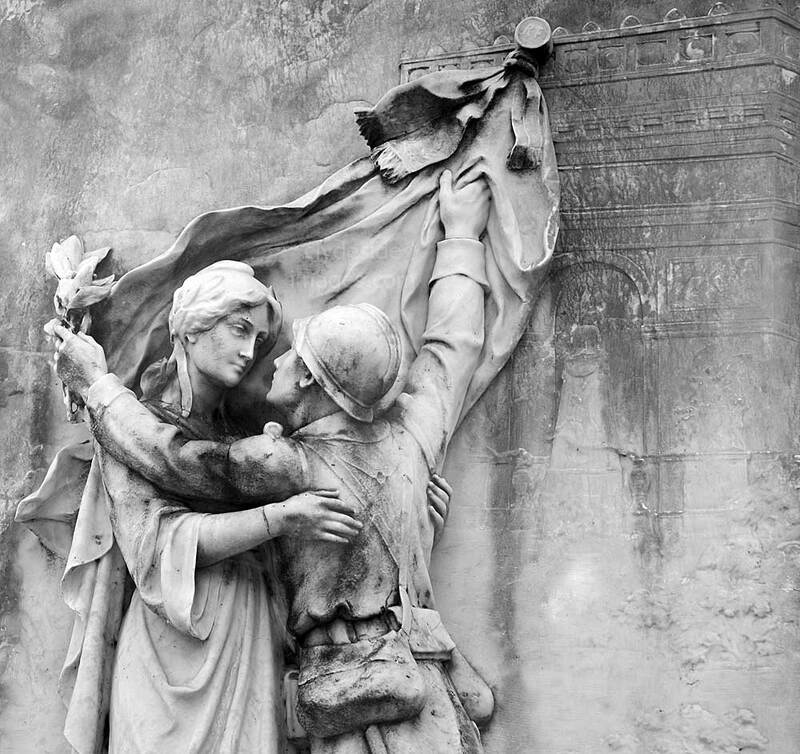 The black & white photographs from the Imperial War Museum`s collection have been used as a result of its `Share & Reuse` policy and are also subject to copyright.